Oh my, did I ever goof!! 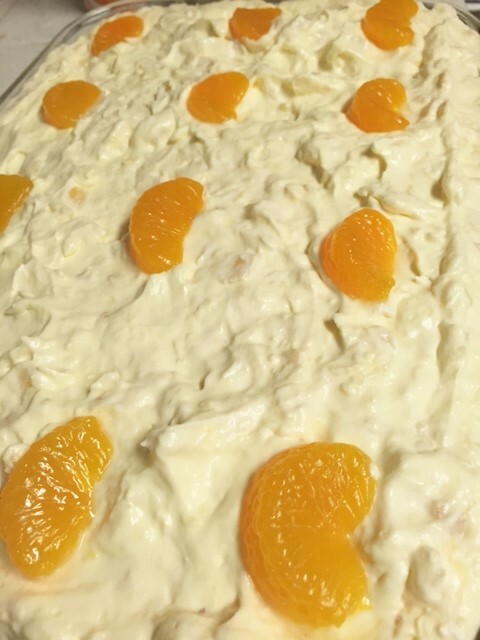 I ruined an entire batch of a wonderful dessert. Ohhhh, yes I did. But more about that in a minute. You just have to try this!!!!!!! Ok, so you want to hear about my big goof? 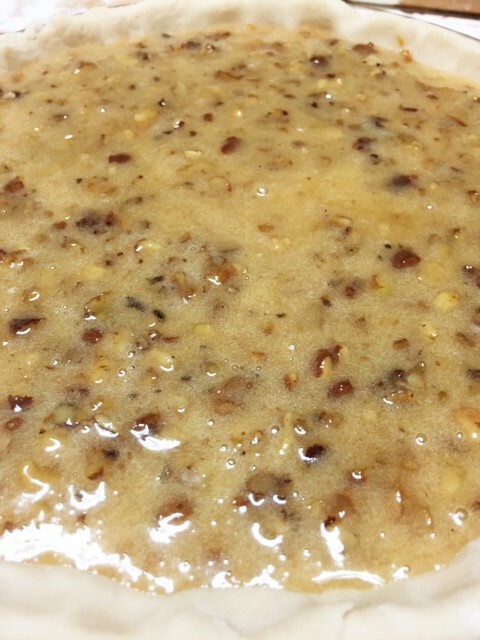 Wasted ingredients….all that butter, pecans….corn syrup…oh big sigh. I ended up making 2 of these pies. I ruined the first one. I mean, it smelled great….it looked beautiful….I could hardly wait to dig in. I waited….and waited for 4 long hours. (not enough time) Cooling time ya know? I ever so gently cut a nice slice. 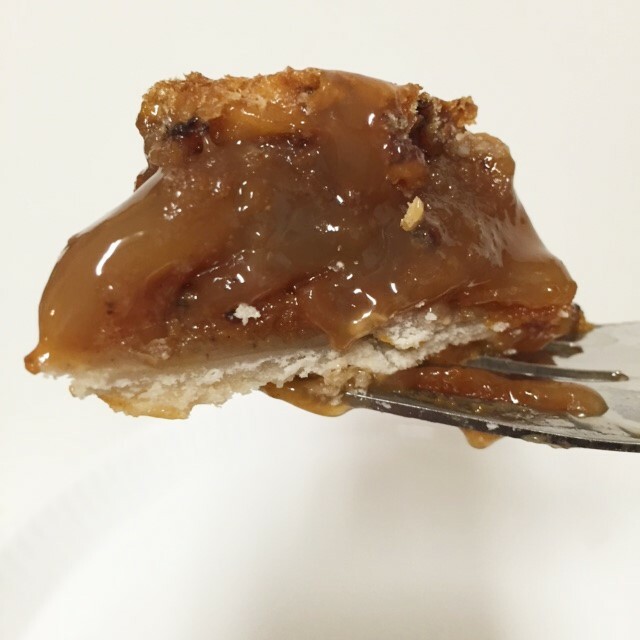 Fork met pie…pie in mouth. Holy crap!!! YUCK. What in the heck! That is when I noticed the measuring cup full of sugar, on the counter. I forgot to add the sugar!!!!! How in the world do you forget to add sugar. 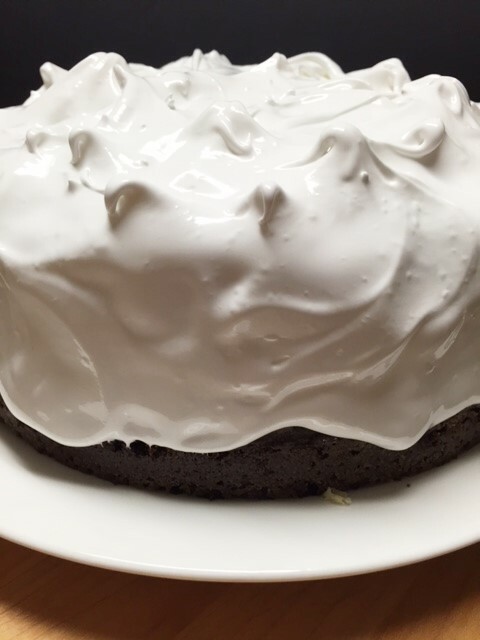 I am a baker…..and I failed. 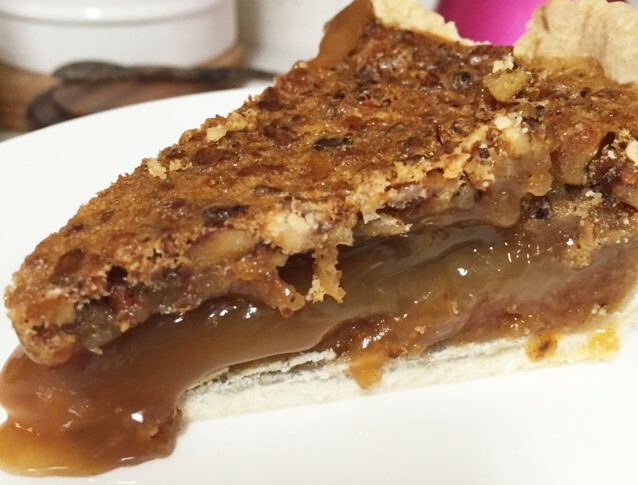 My, my, my…oh my pie. Oh my crappy pie! I just couldn’t believe it. It was ruined. After uttering some pretty bad words, I started over. 😦 Please don’t forget the sugar. look at all that yummy, sticky, gooey stuff! Preheat oven to 350. Line a deep pie plate with your unbaked crust and set aside. 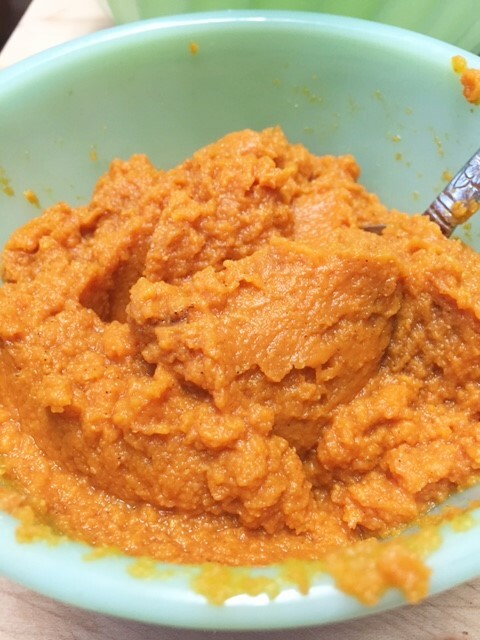 In a small bowl, mix together pumpkin, cinnamon and 1 tablespoon sugar. 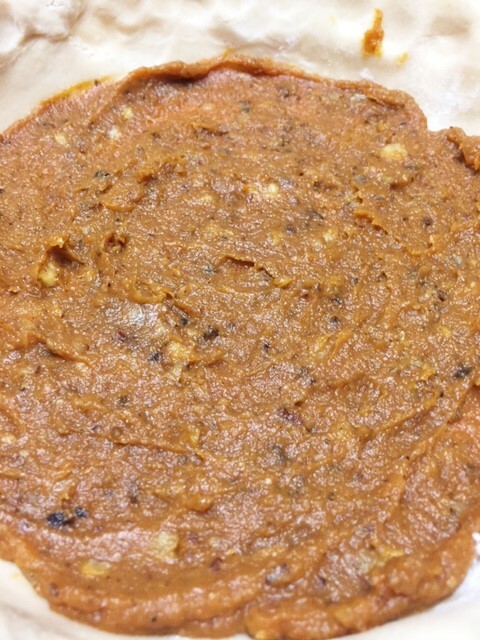 Spread this pumpkin mixture on the bottom of your pie crust. Sprinkle the nuts all over the pumpkin. 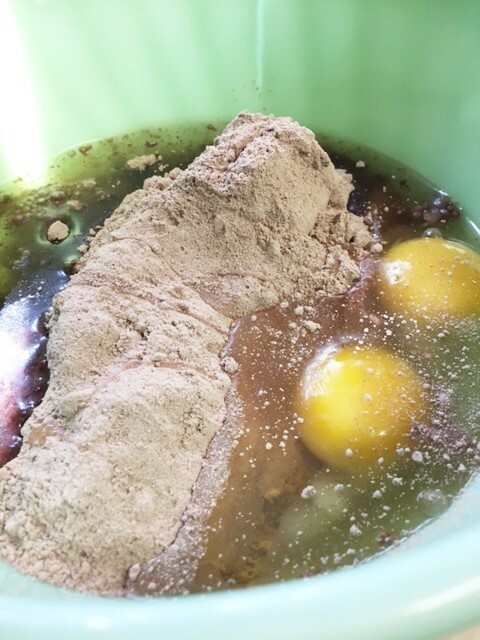 In a bowl, whisk together the 1 cup sugar, brown sugar, eggs, corn syrup, salt, vanilla, melted butter . Pour it into the pie plate on top of the nuts. Bake for 50-60 minutes. But check it at 45 minutes, since oven temps vary. It should only slightly jiggle when you take it out of the oven. 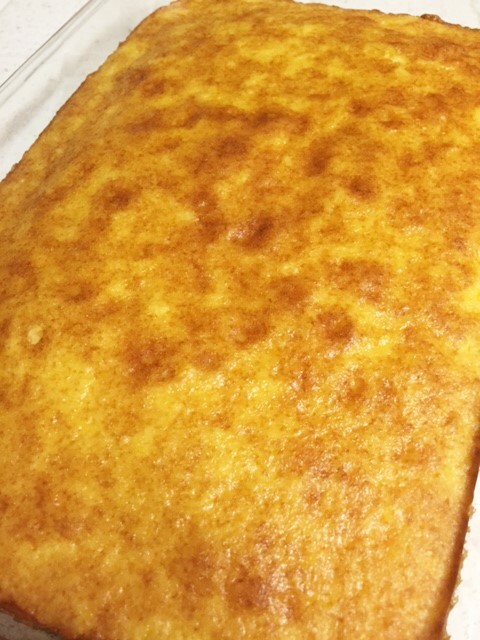 Now for the bad news…you have to let it cool for hours….like 6 hours minimum. Maybe even over night. But trust me, the wait will be worth it. Here is a wonderful holiday gift idea. Not only is it pretty and useful, but you can eat it too! Yes! Wouldn’t you love to get a gift like that? So easy to make. I just made one for a dear friend of mine for her birthday. I made it with both dark and white chocolate and then I filled it with some buttery caramels. She loved it!! Yay! It’s so nice to give someone a gift that you’ve made and then watch them smile. It makes my heart so happy. I’ve made edible bowls before. I have filled them with candies, chocolate mousse, cookies, and ice cream. I even make them filled with non edible items like jewelry, little kitchen gadgets, a nice scarf. You get the idea. It really is a unique gift that always surprises people. Christmas is coming! Know someone you would like to surprise? 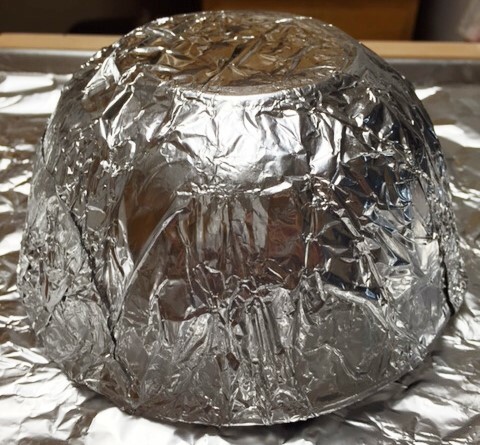 place the bowl rim side down, on a sheet covered with foil or parchment. Start drizzling melted chocolate all over the bowl. pick up the bowl with your hand under the bowl and start drizzling chocolate with your other hand. You can get a more precise design this way. Use enough chocolate and avoid having large gaps or spaces, so that your candy bowl will be sturdy enough to hold any items you plan to put inside of it. Once you are satisfied with your design, Place it back on your sheet pan, rim side down. Place the sheet pan in refrigerator so the chocolate can set up quickly. Once set, you can add another layer or flavor. Chill completely……at least half an hour. 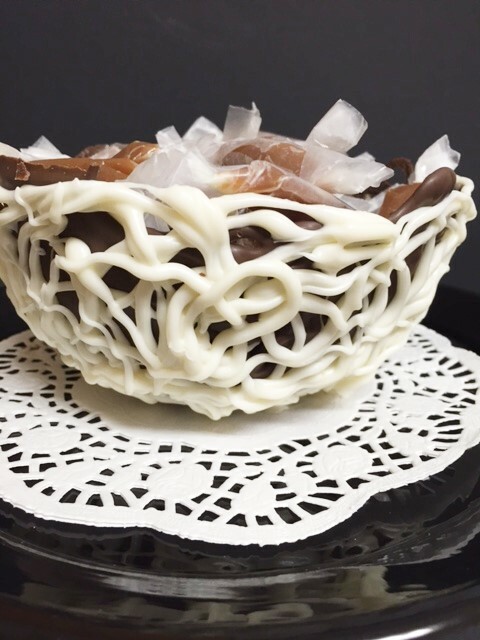 Once your chocolate bowl is set up, very carefully remove the foil or plastic wrap away from the rim of your mold (bowl). Your mold (bowl) should lift right out. 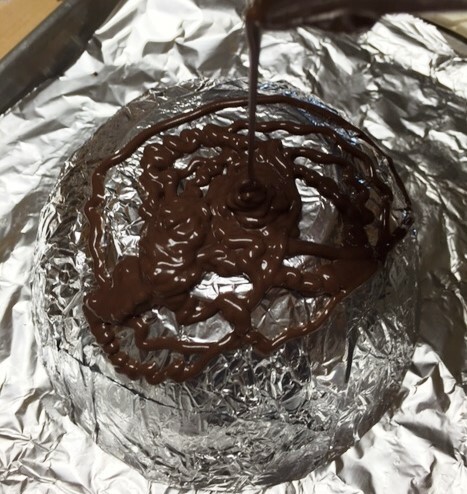 Now, carefully remove the foil or plastic wrap away from your chocolate bowl. If you used foil, tear it in pieces if you have to. There you have it!! A beautiful chocolate bowl. Gently move it to serving plate or gift box. Chill it if you aren’t giving it away right away. Note: If you are not comfortable drizzling the chocolate, you can also just melt your chocolate in a bowl, and then take another smaller foil lined bowl and dip it into the melted chocolate. Then, place it on a foil lined sheet pan, bottom side down, and chill. A balloon works too! 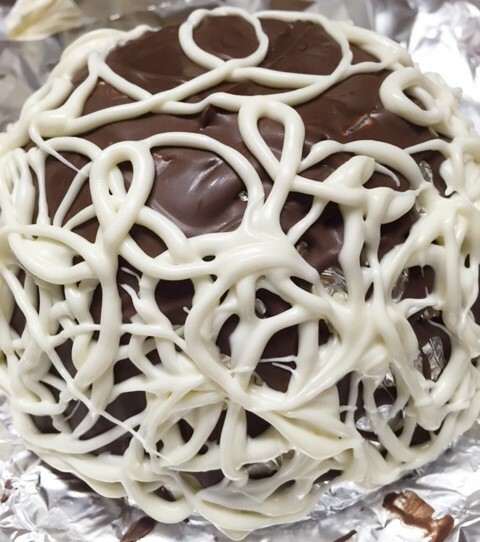 Just blow up the balloon, dip it into the chocolate, set it on a sheet pan. Once it has set up, simply pop the balloon and remove the balloon piece. Easy right? 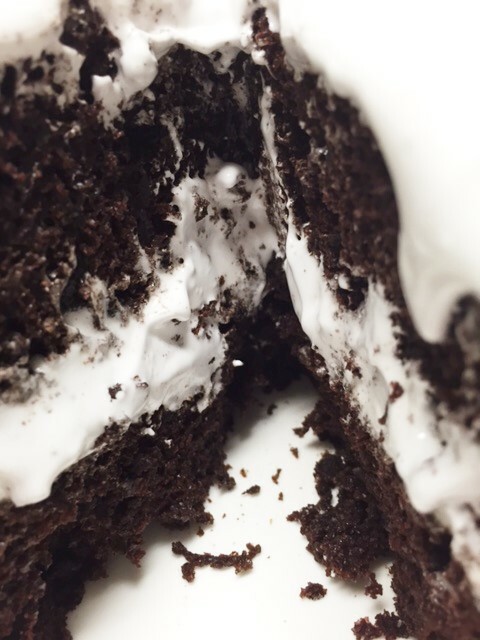 Let’s chat about frosting. I have 3 or 4 frostings that I really like. Otherwise, I’m more about the cake and not so much about the frosting. Too sweet. But I do love marshmallow…..anything marshmallowy. This is one of my favorite frostings. It’s like a cloud…..a big, sweet, fluffy cloud that just floats around in your mouth. Kinda like when you shove a big ol giant marshmallow in your mouth and your cheeks puff out…and you get all happy. Yes, I like that. Now, of course you have to start with a good cake. Unless you’re one of those people who just eat all the frosting and leave the cake all bare. If that’s the case, go ahead and make a crappy cake and just eat the frosting. 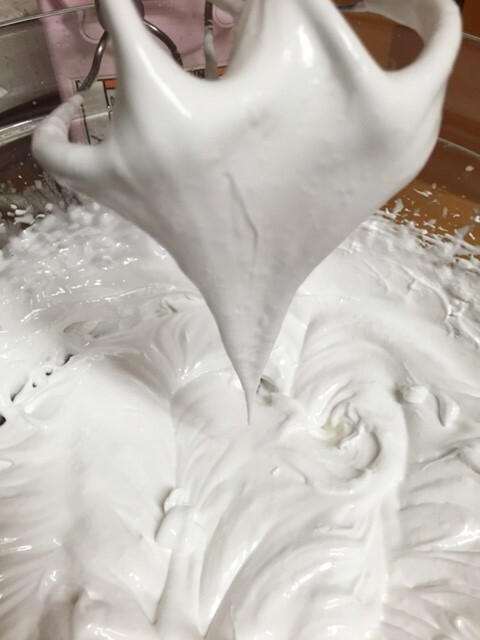 This frosting. 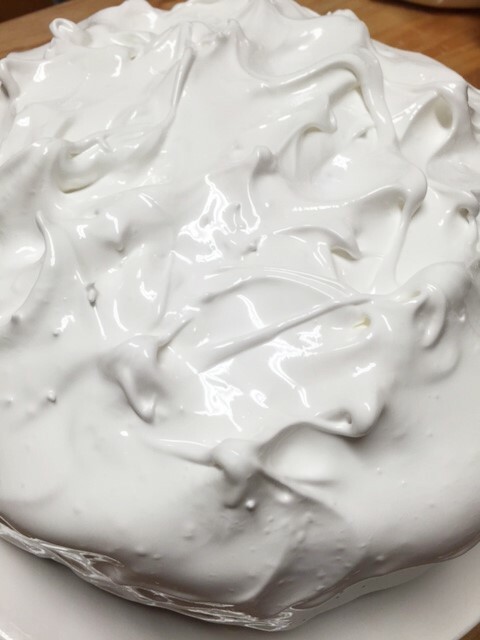 Now this frosting is often referred to as 7 minute frosting, or sea foam frosting, but rather than granulated sugar, you use powdered sugar. But don’t try to make this on a rainy or humid day. 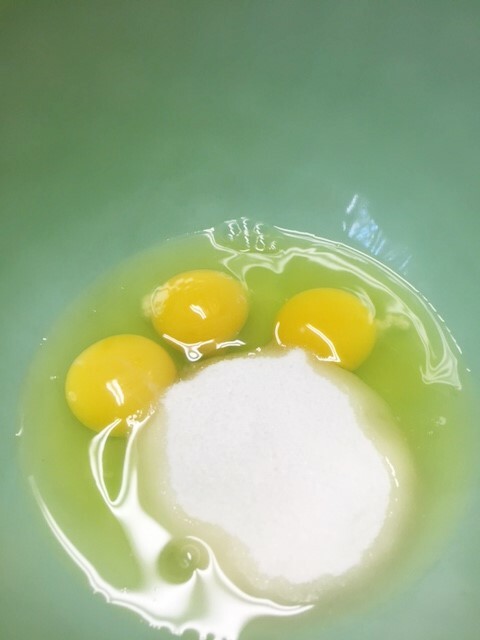 The humidity really affects the lift of the egg whites. 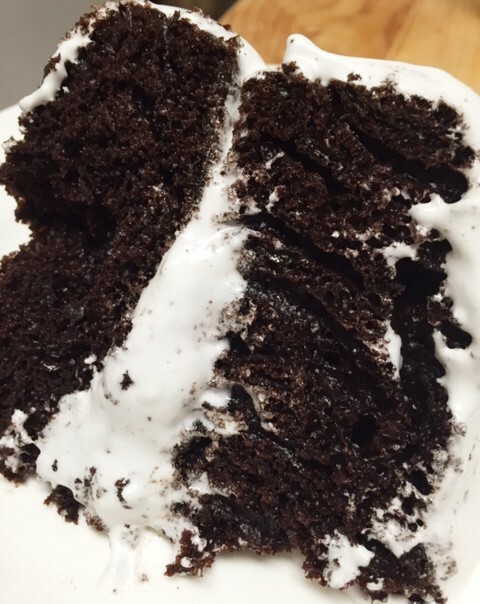 Use your favorite cake (best with chocolate cake) or use one of my recipes. I hope you enjoy this frosting. Make a sugar syrup in a small saucepan by whisking the confectioners sugar and water together. Bring it to a boil for 1 full minute. Remove from heat and set aside. 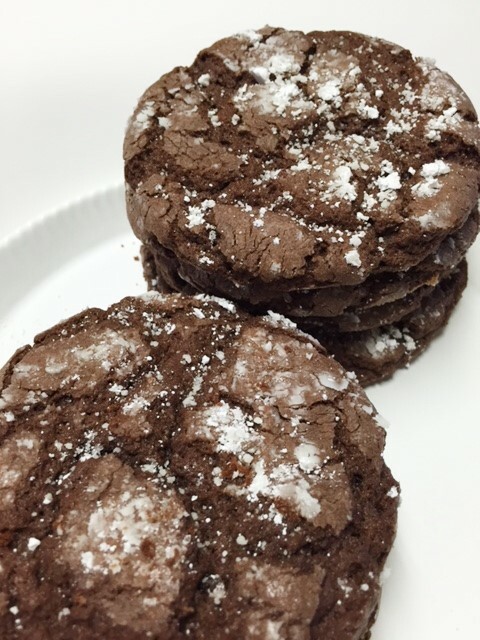 Easiest Chocolate Cake Mix Cookies………. Cookies. I think I love cookies more than cake, more than candy. I love making cookies and I love passing out cookies to neighbors and friends. I’ve come across a lot of cookie recipes on line, that are made with a boxed cake mix. Now, you know I am not a fan of cake mixes. But twice in the past week, I have used them. I have been so curious about these cookies so I had to try it. Even if you are not a baker, you can do this. It is the easiest thing ever! There are so many variations. 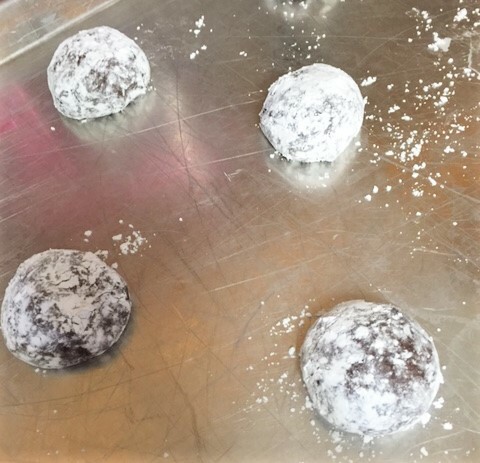 I made chocolate this time……..rolled in powdered sugar. 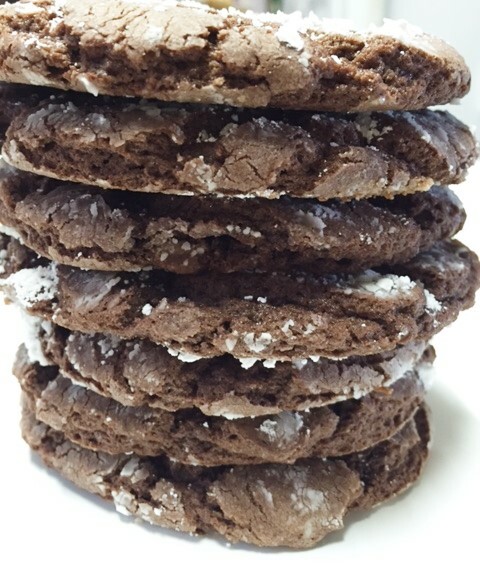 Remember the Chocolate Crinkle cookies that people have been making for years? Well, these are like those. They are chewy, soft and delicious. Did I mention they make a great ice cream sandwich? I may have made one….or two. Seriously, I do not like the processed taste of boxed mixes. 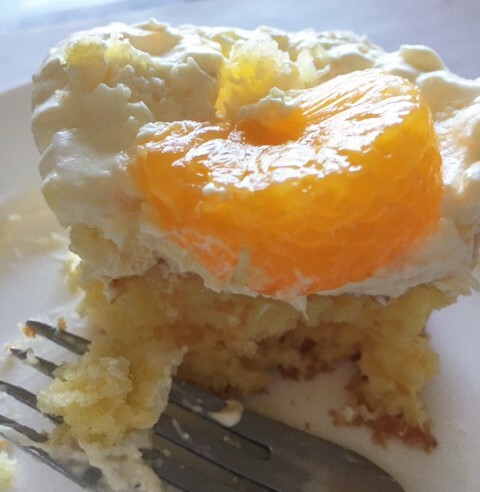 I have several ways of getting rid of that chemical taste if ever I use a boxed mix, (future post) but I really prefer a cake from scratch. But I will definitely make these cookies again. In fact today I think I will do a snickerdoodle version for my neighbor who is feeling a bit under the weather. Dump everything in a bowl and stir well with a wooden spoon. 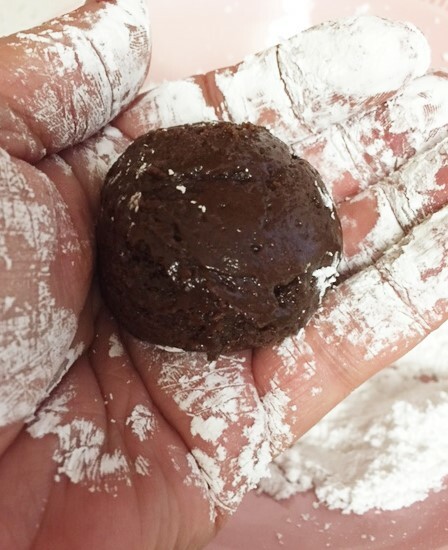 Scoop into golf ball sized balls, roll in powdered sugar and place on ungreased cookie sheet. Bake at 350 for 8-10 minutes. I made slightly bigger cookies and baked them for 11 minutes. That’s it!!!! Can you believe it?? ok, my non baker friends….do this!! you can, you can!! !